Your next summer destination is waiting for you! With its catchy beats and lyrics, the Slurpee Summer Hit Song of 7-Eleven will surely give you major LSS! Jam with your favorite OPM bands — Gracenote, Autotelic, and December Avenue, and complete the song’s open-ended lyrics to win a summer vacation trip! The mechanics are simple! 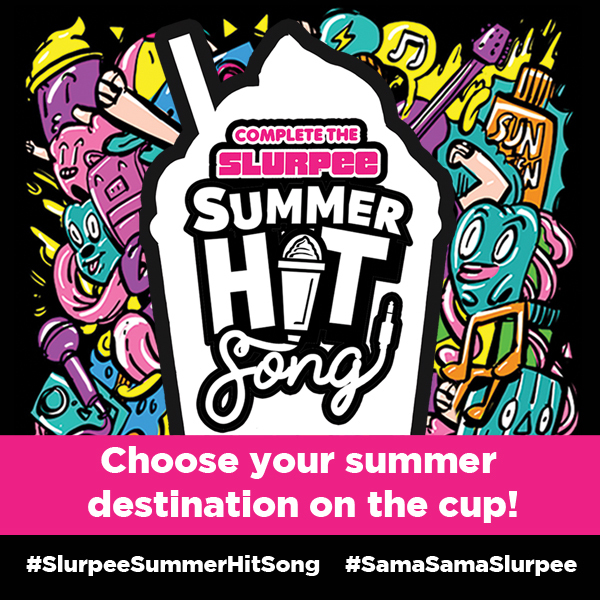 All you need to do is complete the Slurpee Summer Hit Song’s open-ended lyrics (catch it playing in 7-Eleven stores or on Spotify) by purchasing special 22oz Slurpee Cups featuring cool summer destinations such as Cebu, Bohol, Siargao, and Palawan. For non-CLiQQ users, your receipt will be the official raffle entry. Be sure to write your name, address, contact number and signature at the back of the receipt and drop it in the Slurpee Summer Hit Song dropbox. For CLiQQ users, have your CLiQQ barcode scanned to get an e-raffle entry. No need to sweat it out as you now have a chance to travel to your dream destination with just these simple steps! The destination with the most number of cups bought will be the winning destination. Four (4) lucky winners, two from the physical raffle and two from the e-raffle, will be drawn from the pool of customers who chose the winning destination. The raffle winners can then choose their preferred destination (Cebu, Bohol, Siargao, or Palawan) and tag along two of their friends for an all-expense paid* barkada summer getaway. So, what are you waiting for? Go to the nearest 7-Eleven store and complete the open-ended song that could earn you and your barkada a ticket to an unforgettable summer adventure! Visit 7-Eleven Facebook page for more details. The promo runs from April 25 - June 6, 2018, and is available at all 7-Eleven stores with Slurpee. *Prize includes Round Trip Airfare, and Hotel Accommodation for Three (3) Days and Two (2) Nights.